Hello Sunshine! Those who know me-know me, knows how much I love my period! I know that sounds kinda funny, but it's true. I get excited when I get my period--because I feel like everything is normal when I do. OK for some context, last November I had an ovarian cyst removed--a cyst I didn't know I had, and only discovered after having a check-up when my period became outrageously irregular. So yes, I think I have license to get excited about my period! Even more... with our topic for the day, Whisper Skin Love, my excitement about my red days reaches a new high! Keep on reading to know my red days story, and why Whisper Skin Love changed the game for me. That whole medical she-bang left me to deal with super strong flow when I had to take hormones. And, you can only imagine the stress having super strong flow left me to deal with. I kid you not, there were days I had to wear maternity pads just to make sure I don't get stained! Likewise, overnight pads became my every day choice--and I even have to change a LOT because my pad would overflow... TMI na ba? So I was genuinely excited when Whisper Skin Love was introduced to me. I discovered Whisper Skin Love through Sample Room, where they're giving away FREE samples of this revolutionary napkin. You can score free samples still, just go to this link for the Whisper Skin Love Day/Night pads, and this link for the Whisper Skin Love All Night pads. After Sample Room, I also got invited to the exclusive media launch of Whisper Skin Love. There of course I had the chance to support the very nice and always beautiful (and makulit) Isabelle Daza. In the photo below, I am chillin' with Belle and Marge (who took the Whisper Skin Love event photos featured on this post). At the event, Belle shared her secrets to sophistication and and her go-getter attitude about life. Truly, she is a woman who wears so many hats oh so well, mind you and I jotted down some insightful tips on how to ba an all-around woman, even during our red days. Among her tips that I completely agree with, is about choosing what is best for you (even over the seemingly mundane choice of what sanitary pad to wear)! Because her schedule is pretty hectic, and she has so many roles to fill, her period is definitely not a show-stopper. 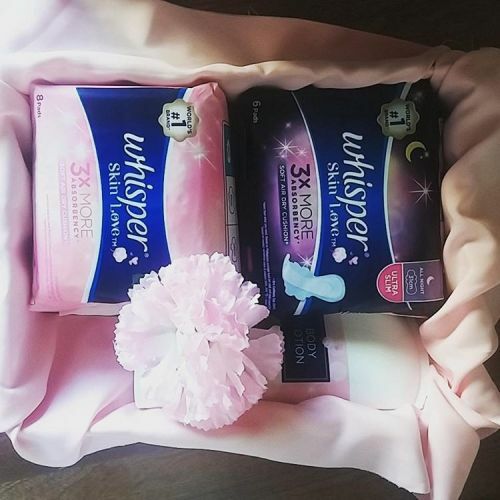 Thanks to Whisper Skin Love, she continues to feel fresh despite having her period. WHY? Because Whisper Skin Love is not your ordinary pad! Whisper Skin Love is so thin and light, it's almost as if it's not there! However, because of its "magic beads" it can deliver a stain-proof lock-in system that holds your period in, even on days when your flow is pretty strong. 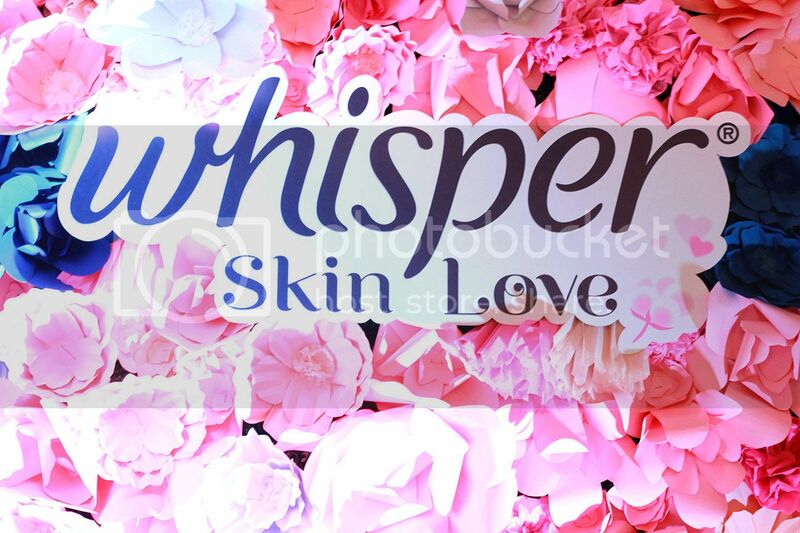 This combination of lightness and absorbency makes Whisper Skin Love an extraordinary pad. Personally though, what I find really good about Whisper Skin Love is its super soft lining. It's like mega-plush soft to the skin, thus the feeling of uncomfort and fear of getting rashes during my red days is completely thrown out the window! Really, when you touch the lining of Whisper Skin Love, you'd instantly notice the difference. It feels like pure velvet. It feels like a teddy bear!!! Anyway, suffice it to say, I've found someone new to love naks! Hugot pa more! Try it for yourself! Head over Sample Room to #FeeltheLove of #WhisperSkinLove.